Salvadoran police and prosecutors moved against the gang MS-13 this week in an operation across the nation. Authorities indicated they were arresting more than 400 gang members in another attempted blow at the finances of the gang. Authorities seized weapons, property, drugs and vehicles associated with the gang. 1. Salvadoran authorities have a tendency to arrest many more subjects than they actually have proof against. 2. Prior mass raids have not had any measurable effect on levels of crime and violence in the country so far as I can tell. 3. A question being raised is why authorities have only staged these large scale raids aimed at finances of the gang MS-13. To date, there has not been a similar attack on the two "18" gangs -- 18-revolucionarios and 18-sureños. Authorities say only that they combat all criminal groups andonly make such raids when they are prepared to do so. The corruption trial of the former president of El Salvador, Antonio Saca, is drawing to a close. Saca has already confessed to diverting more than $300 million in public funds. Now he and his co-defendants will wait and learn their fate. The periodical El Faro has been reporting on the financial accounts which made this possible. Essentially, the Executive branch in El Salvador has been given a budget of funds by El Salvador's legislature which is treated as "under reserve" or secret. These are discretionary funds where the president is supposed to decide where they should best be spent. Presidents from both parties have treated these funds not only as discretionary, but as one for which they need not be accountable to anyone. Government auditors are not granted access to the account spending. No disclosure is made of how the money is used. Presidential spokesmen refuse to answer questions from the press about the funds. This article originally appeared on the website of InsightCrime with the title El Salvador Congress Makes ‘Extraordinary’ Prison Measures Permanent. El Salvador’s Congress passed a bill that makes permanent a previously temporary tightening of security measures in prisons, cementing a policy that has been criticized as ineffective and harmful to inmates’ human rights. Congress passed the bill on August 16. It empowers the Justice and Public Security Ministry to take “all necessary and indispensable measures” to cut off telecommunications to and from detention facilities, and gives prison directors broad authority to suspend visitation privileges for periods of up to 30 days, according to a congressional press release. Yesterday, would have been the 75th birthday of former Salvadoran major Roberto D'Aubuisson, leader of death and torture squads, giver of the order to assassinate Oscar Romero, and founder of the right wing ARENA party. Party leaders, including their presidential candidate Carlos Calleja and Norman Quijano, president of the National Assembly, gathered at D'Aubuisson's grave to celebrate their former leader. 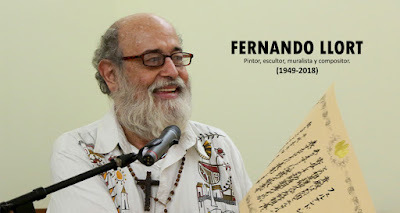 When Fernando Llort died on August 11 at the age of 69, El Salvador lost a beloved artist, a promoter of peace, and an inspiration to many. His paintings are in the collections of museums around the world, but Llort's designs can also be found on everything from ceramics to beach towels to wooden crafts, and his style overflows in gift shops throughout the country. From the New Yorker, An Asylum Seeker’s Journey from El Salvador to Arkansas, and Back Again. A Salvadoran youth narrates on a video his flight from El Salvador only to be denied asylum under Trump and deported back to an uncertain future in El Salvador. From the Los Angeles Times, Beaten and raped in El Salvador, a domestic violence survivor finds little hope for asylum in U.S. Describes the situation of a Salvadoran woman who fled after being beaten and raped by her boyfriend. She now faces highly uncertain prospects of remaining in the US after Attorney General Jeff Sessions reversed prior law to limit situations where domestic abuse victims might receive asylum. This article originally appeared in English on the website of InsightCrime, translated from the Spanish original at Revista Factum. When former El Salvador president Antonio Saca admitted to being behind of one of the most well-known robberies in the country’s history, he knew that there was something good waiting for him. Seated in the witness chair, Saca described in a strong and clear voice how he and a group of his closest confidants embezzled more than $300 million of public funds during his five years in office. It’s unusual to recognize that theft brings benefits. But Saca, who was arrested in 2016, had made a deal with the Attorney General’s Office: If he confessed, he would face a lighter sentence. I was on sabbatical from posting to El Salvador Perspectives for the last few weeks. Here is a short summary of some of the recent news during that time. I will be expanding on many of these stories in coming days. Tony Saca's confession to massive embezzlement and money laundering. Former president Tony Saca has confessed to embezzling and money laundering charges involving more than $300 million in public funds during his administration. His ongoing corruption trial has revealed a wide-ranging machine to divert funds from hidden accounts controlled by the presidency to bribe journalists, enrich Saca and friends, and fund ARENA political campaigns. In the two years since the repeal of the amnesty law, El Salvador has taken tentative steps towards establishing accountability for the atrocities of the civil war. Are these nascent advances in transitional justice threatening political stability and exacerbating present-day challenges as critics feared? Alternatively, could seeking accountability for past abuses facilitate efforts to tackle widespread impunity for contemporary crimes? Read the entire article to get their thoughts.